Author Baba Prasad talks about the five types of agility a company must have to stay nimble. Companies like Digital Equipment Corp. and Ericsson were once considered leaders in their industries, and thus likely to stay on top. But they failed because they lacked the ability to think and act differently from their pre-conditioned ways. They either did not anticipate imminent technology changes or did not have the flexibility to respond to disruption. Others, like electronics and home appliances maker Haier of China, have retained the nimbleness of their startup days. In order to manage and surmount uncertainties, companies need to become intelligence-driven, and that is achieved by understanding and acting upon five types of agility, notes Baba Prasad, CEO of the Vivékin Group, a management consulting firm in Durham, N.C., and in India. 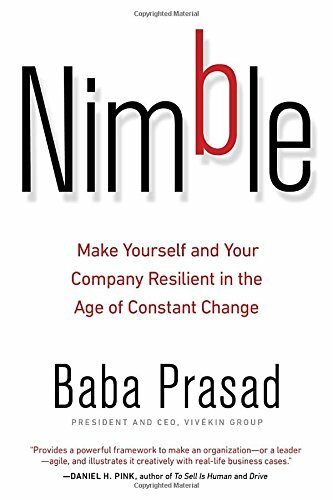 He discusses these concepts in his book Nimble: Make Yourself and Your Company Resilient in the Age of Constant Change. Prasad spoke with Knowledge@Wharton about his book in a recent interview. Knowledge@Wharton: What inspired you to write Nimble? Baba Prasad: When I started out, the big debate in IT circles was on how to justify productivity from IT. My work in the service and retail industries [helped] me understand that there’s a huge people component, especially in information technology. I began to argue that information technology needs to be [evaluated] more in terms of the flexibility it brings to an organization. How to evaluate that flexibility was [the next] question. I tried various micro economic models and quantitative modeling, but [could not] develop a generalized theory about flexibility. In the winter of 1998, I was in Helsinki, attending a conference on information systems. I had forgotten [to carry] the adapter for my laptop, and didn’t know Finnish or much about Helsinki. I ultimately found a store that had the adapter I needed. The adventure of getting there and getting back to the hotel started a chain of thoughts. How do we handle uncertainty in our individual lives? Humans have always used intelligence to handle uncertainty and find their way in new situations, just like I had done in Helsinki. That inspired me to think of a different way of approaching agility and trying to think of the organization as an intelligent being. What is the organizational equivalent of human intelligence? That led to the book. Knowledge@Wharton: Agility is not easy to define. Why does it matter for companies and individuals? Prasad: Agility is often confused with a speedy, reactive response. We can instead think of agility as a speedy and effective response, not just toward current circumstances but also [to factors] that may now be beyond the horizon. It’s not just a reactive response; it also is a strategic response. This is where [the concept of] strategic agility needs to come in. [Strategic agility] makes one say, “I’ll be prepared to handle a future which unfolds.” But then, we don’t know how it will unfold. So, the concept of strategy now changes from being plans of actions for the future to developing capabilities that can allow us to handle different [situations] that may evolve. If you don’t have [an agile approach], you die; many companies have folded when [they didn’t] have agility. Knowledge@Wharton: It may be interesting to look at a company whose success was driven by agility. Could you give an example? Prasad: Absolutely. The retail industry is going through tremendous ups and downs with many store closings and the shift of customers from regular stores to online marketplaces. There’s tremendous turbulence in that market, especially the fast fashion industry. The Spanish company Zara has understood that at the center of the whole turbulence is the customer. The customer’s tastes change rapidly. How would you prepare [your organization] to handle this customer, who is now globalized and whose tastes are difficult to predict? [Zara has] done a fantastic job of being able to sense and respond, and also think strategically within its organization in terms of preparing to handle circumstances such as changing customer [tastes]. Knowledge@Wharton: What are some of the implications if a company is not nimble? Can you give an example of a company that paid the price because it wasn’t as nimble as it should have been? Prasad: Let’s go back in history to the early 1990s when the microcomputer, or the PC, emerged. DEC, or Digital Equipment Corp., is an example of how companies can just die even if they’re huge. It was a $14 billion [computer] company in the early 1990s, with offices in 95 countries. It was second only to IBM. But in a matter of six to seven years it folded, because it didn’t anticipate the emergence of the microcomputer. Compaq ultimately bought it. A company cannot rest on its resources because it is too big. You can’t afford to think you’re safe. DEC is a classic example of a company that was not nimble and had to pay the price by dying. Knowledge@Wharton: Why is it so hard for companies to be nimble? Could you speak a little bit about barriers to agility? In such cases, you can’t make massive investments. You have to be prepared to make smaller [investments]. It’s like walking on ice. You can’t take giant strides on ice. You need to take small steps and make sure the ground is firm before you take the next step. The second [aspect is] culture. People try to change the entire organization’s culture. That needs to be tempered a bit. We need to do it in smaller bites, run it in smaller divisions, and see how that works. Is there something peculiar to our company that is different from what is the best practice out there? How do we bring in those [practices]? These structural changes that we need to bring in to accommodate for culture are some of the big barriers to companies becoming nimble. Knowledge@Wharton: In addition to Digital Equipment Corp., another interesting example in your book that I found illuminating is that of Nokia. What’s interesting there is that Nokia was nimble in some respects, but that wasn’t enough to save the company. Could you tell that story and what can we learn from Nokia’s example? Prasad: The future [belongs to] what I call the intelligence-driven company. What does that mean? When I looked at agility from the intelligence perspective, it occurred to me that in psychology literature, we no longer talk about IQ; we talk about what is called multiple intelligences. For instance, a musician may be tremendously intelligent but may not be able to score high in an IQ test. You’ll see that intelligence expressed in musical talent. Similarly, a basketball player might be extremely good on the court, but doesn’t score high in an IQ test. This led to the theory of multiple intelligences. When I started to think about agility and the organizational equivalent of intelligence, I talk about multiple agilities. So there’s not just one agility, but multiple agilities in the organization. Nokia is an example of how a company can be agile or nimble in certain ways, but not nimble in other ways, which led to its downfall. Nokia was fantastic with supply chain agility. There’s a case that I trace in the book about a fire at the Philips semiconductor factory in New Mexico (in 2000). [Nokia, whose phones used Philips chips], was able to recover from that, although a critical chip was missing. [Another Philips customer] Ericsson faltered because of that same problem. Ericsson folded and had to be bought over by [its joint venture partner] Sony [in 2011]. Nokia was a perfect example of supply chain agility. But it didn’t carry that agility over into other dimensions. There are lots of ways in which Nokia demonstrated lack of agility. For instance, it didn’t do anything when Google released a new Android operating system, and [Apple released its] iOS [operating system]. It didn’t anticipate those. As a result, it stuck with its old Symbian operating system and that failed. Also, when Motorola introduced clamshell phones, Nokia just didn’t respond to that, and lost market share in America. Knowledge@Wharton: You say there are different kinds of agility; it’s not a monolithic aspect. A company can be agile in some areas but not agile in other ways, and that can lead to its downfall. Looking at your approach of what you call strategic or intelligence-driven agility, could you explain your model of five agilities and how this approach differs from the way in which companies have traditionally thought about agility? Prasad: Let’s look at the five types of agility. Analytical agility is the first one. It is about being able to change modes of analysis. You’re not stuck with one approach to solving problems; you can have multiple approaches. For instance, in budgeting, you’re not just thinking about returns on investment and discounted cash flows. You may also [consider] options thinking, which is a new way of thinking about investments. Then you have the operational agility. If something fails, could we find another way of doing the same stuff? If on a production floor one machine fails, do we have another machine that can take over and do the job? Inventive agility is the ability to solve problems in new ways or find new solutions and [create] new products. It drives innovation. But a lot of it is about adapting an existing product or solution to a new market. Sometimes you might have to invent a whole new product. Inventive agility gives you the ability to do different kinds of innovation. Communicative agility is all about persuasion. This is where either the marketing function of a company or the persuasive leadership of an individual comes in. You see this often in presidential debates in terms of personal leadership, but also in companies when they handle communication crises, when they have to engage in marketing campaigns to promote a new idea. It allows us to use different persuasive methods. Do we cajole? Do we threaten? Do we use fear? But basically [it is about] motivation and convincing others about the value of what we’re saying through words and speech. For a long time I [spoke of] just these four [agilities] –– analytical, operational, communicative and inventive. But suddenly one company that I said was a prime example of using these four agilities collapsed overnight and that was Enron. For six consecutive years before it collapsed, Enron was named the No. 1 innovative company in the world. What happened here? When you traced it back, one could easily say that it was a breach of ethics. But after going back to the drawing board and thinking about it for several months, [I realized] this was not just an ethical breach; it was a lack of thinking about the future. It’s a lack of foresight. It’s a lack of thinking about the visionary aspect of it. That’s why I [added] a fifth agility, which is called visionary agility. It recognizes the long-term impact of what you’re doing now. It thinks about the ethical implications. It goes beyond the here and now and extends into thinking beyond bottom line, beyond selfishness. Knowledge@Wharton: If we were to dive deeper into each of these five agilities, how could companies develop each of these? What lessons can other companies learn from those that have succeeded in developing these agilities? Prasad: Let us start with analytical agility. Companies usually get trapped into doing things one way, especially in terms of analysis. I’ll give you a classic contra-example here. It’s a well-known story of McKinsey and AT&T. In the mid-eighties, after AT&T was broken up by the U.S. Supreme into [regional] Baby Bells, it had a lot of cell phone lines on its hands, and it didn’t know what to do with them. It approached McKinsey, which did an analysis and evaluated the cell phone lines just as you would evaluate soup or any other consumer product. They predicted that by 1999, there would be about 900,000 [cell] phones in the world. So AT&T got rid of its cell phone lines. But eight to 10 years later, the cell phone market was exploding, and 900,000 cell phones were being sold every three months. AT&T was then scrambling to buy back all those cell lines it had sold and had to pay about $5 million to get back those lines. Now, what happened here? It’s not that McKinsey did not have analytical skills. But McKinsey used a consumer product model and applied it there. It only had to look back and realize that between 1905 and 1910 or so, when AT&T introduced landlines, [the market exploded]. The same was happening with cell phone lines, and that was because of something called network effects, where the value of the device [increases] as the network expands. In fact, that increases exponentially as the network size increases. If [McKinsey] had just recognized that and used that model instead of the consumer products model, it would have made a very different suggestion. This is a classic case of how companies need to think about using different kinds of analysis within their organization, and that’s analytical agility. In operational agility you need to think about different ways of doing things. It’s not just one way of production, or just one way of supplying the market. You [have to] introduce supply chain and manufacturing flexibilities. Inventive agility [is about] different ways of generating and evaluating ideas. How do you take an idea from concept to products? One caveat I want to offer here is that commonly, innovation is perceived to be a good thing. But sometimes it can actually be a bad thing. Lego discovered that the hard way. They had done too much innovation, and as a result [its] products were cannibalizing themselves in the market. Another story I tell in the book is of [adhesives materials maker] Avery Dennison, which also over-invested in innovation and as a result had too many products going into production. Manufacturing and the supply chain became difficult to manage. These are cases where innovative intelligence or inventive agility ran amok. In communicative agility, you must always have [different] ways to handle different markets. Are you tailoring your message to the market? Do you have different ways of reaching different audiences? What happens in a crisis –– do you have a crisis plan to get your message across and mitigate the negative impact on your brand? Visionary agility is all about the mindset. It’s about responding to the situation [at hand], but what is the long-term thinking? Five years from now, by this response, because of this response, where will we be? Is it affecting a broad swath of people, or a narrow swath of people? How broad is the impact? These are questions that have to be developed into the culture. This has to be consciously incorporated into decision-making, where you’re not just responding to a crisis at the moment, but also thinking about the long-term consequences. Knowledge@Wharton: How do these five work together? Prasad: Companies need to look at the world outside and the way it’s evolving and ask, “Which of these five agilities do we need?” The analogy I use comes from art. If you think of the four agilities — analytical, operational, inventive, and communicative — as primary colors, [the response to] any situation is a combination of those. You can combine them just like you combine the primary colors to get any color. But you need the visionary as a medium to mix those colors, because otherwise you will be making terribly reactive responses that may hurt you in the long term. Knowledge@Wharton: When companies start out and they’re in a startup phase, they tend to be very scrappy and nimble and fast-moving. It’s a small team and very passionate. But as they grow in size as a result of this and become more successful and big, somehow they seem to become more sluggish. Is there a way for companies to remain agile, especially as they grow in size? Prasad: There are [ways]. For instance, Haier, the Chinese company, has grown from being a startup to become a world leader especially in dishwashers and refrigerators. They have maintained the culture of business-model innovation. They’re not stuck to one kind of business model. They’re constantly evolving their business model. It’s built into the organizational structure that they’re constantly evaluating what they’re doing. You could consciously do that at a company. Knowledge@Wharton: You’re quite right. Knowledge@Wharton recently published an interview with the CEO of Haier, Zhang Ruimin, where he explained its business-model innovation and the micro-enterprise strategy. In conclusion, what advice would you give CEOs who would like to get started on making their organizations more nimble and agile? Where do you think they should start? Or you might say, “We are overinvested in these agilities that do not seem necessary. So let’s scale down our focus on these excess agilities.” That’s where one immediately begins to see the shift in the mindset, and in the culture. One of the beautiful things about this model is that it’s also a model for personal leadership. It goes up and down the organization from the individual right up through the organizational structure. Very interesting and educative article. Just wish to add that agility alone is not enough. Companies must also develop the capacity to absorb shock and nimbly stay afloat whilst being agile. Also, righteous values and good ethical/moral practices, which are the DNA of an organization constitute a platform upon which strategic agility must stand. Core values and good ethical/moral values reflect the intrinsic character of the founders/leaders of organizations and cannot be replaced by visionary agility, which represents evolving views of markets/customers and how they may be served. I hope Prasad’s book is better written than the examples cited in the article. As far as I am aware Ericsson is still a dominant player in the telecom equipment market. He refers to a joint venture with Sony which was a attempt by both companies to compete in the handset business. It was unsuccessful so was closed with almost no impact on Ericsson’s core business. It seems organizations with finely tuned stakeholder listening systems and a culture that reflects well-known characteristics of high performing cultures are most likely to demonstrate the type(s) of agility described by the author. What the author also describes, without explicitly stating, is the challenge of managing ongoing tensions or polarities that exist in all organizations. The Avery Dennison story is a good example whereby the company seemed to overemphasize innovation to the neglect of efficiencies. The downside or potential unintended consequences of emphasizing innovation were probably never considered. 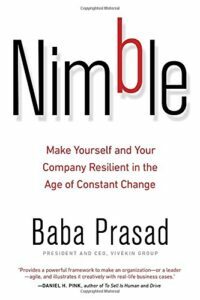 I’m quite sure many companies that enthusiastically embrace Mr. Prasad’s advice to become nimble will experience unintended consequences if they fail to manage the ongoing tension between agility AND stability. Overemphasis of either pole carries downside risk just as centralization AND decentralization have upsides and downsides. The author might address this phenomenon in his book.